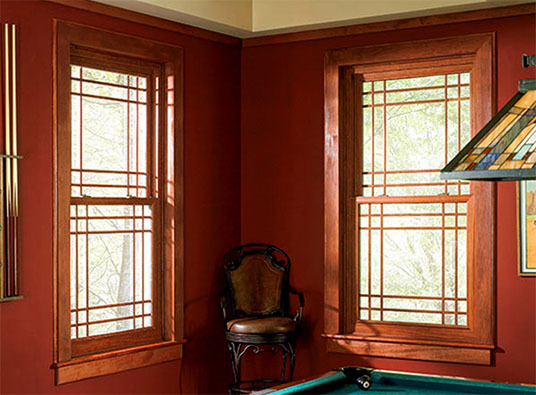 Alside® vinyl windows make for an ideal wood window replacement in Detroit, MI. They come with exceptional features that deliver unparalleled longevity and energy savings. In fact, you can personalize them further with a variety of design options. Kroll Construction, an authorized dealer of Alside windows, discusses some of them. Alside uses a vinyl laminate when manufacturing their high-quality windows in creating this solid-color trim. This is made to match your window’s wood tone and grain exterior without its upkeep. They are available in five popular molding profiles and in a wide range of interior finishes for a calming feeling, while still reflecting your personal preferences. Choose from white and beige, along with laminated woodgrains in Soft Maple, Rich Maple, and Light Oak. You can decorate our Alside wood window replacement in Detroit, Michigan, further through custom-crafted interior grids. Enclosed in insulated glass for a livable home, they add style and elegance to your home. Furthermore, they do not become an obstacle whenever you clean your windows. Our grid patterns come in Colonial, Diamond, Prairie and Double Prairie. They are also available in many profiles such as Narrow Brass, Contoured Foxwood, and Classic Beige. Our decorative glass options present old-world charm with a modern impression. We offer two glass options – V-Grooved/Cut Glass and Beveled-Leaded Glass. Our Cut Glass will add perfection and elegance to your window style. They are leaded and made of crystal bevel clusters, hand-cut glass, and hand-soldered camming. Choose from an extensive selection of styles such as StarCrest II, StarCrest III, and Prairie to make your home more distinct. Meanwhile, our Beveled-Leaded Glass offers timeless style and beauty and will surely add more character to your home. They come in four unique styles such as St. Joseph, Jackson, and Hannah, to complement the existing architectural style. Add depth and detail to your home with a Detroit, MI, wood window replacement from Alside. Let Kroll Construction help you personalize your windows further with these exceptional design options. Call us today at (888) 338-6340 for a FREE, in-home consultation on your replacement windows.